Naturally I am going to talk about the power supply potion of BenchVue (this is a power supply blog after all). 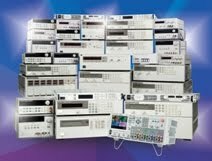 Presently the software supports the Agilent N6700 Modular Power Supplies and the Agilent E36xxA Basic Power Supplies. I do not know if many people remember but we used to have a free software package for the E36xxA power supplies called Intuiilink. BenchVue is the modern successor to Intuiilink. I recently checked BenchVue out on my E3646A DC Power Supply. You can program all of the basic settings (even for multiple channels) on your power supply on one screen. If you used the front panel to do all of these entries it would take quite a while to navigate through all of the menus. BenchVue saves you time by putting all of this in one place. The other neat thing that I noticed is that you can get the voltage and current readback from both channels on the screen at the same time. You can't see both channels on the front panel, you have to manually switch. The other main feature of BenchVue that can save you some time is the built in datalogger. For those of you that are unfamiliar with the term datalog, this is when an instrument takes measurements at a predetermined time interval and stores them in a file that you can look at later. With BenchVue, you can set a datalog up to take a measurement as fast as every second. You can then take the stored values and export them to Matlab, Microsoft Excel, Microsoft Word, or to a CSV file. You could write your own datalog program but the beauty of BenchVue is that you can set the log up by entering a few values and then just press the "Run" button to make it go. You also do not have to worry about formatting the data or creating files since BenchVue does all of that for you. You basically just run it, then export the data and then you can view it in your chosen format. That's my short intro to the new Agilent BenchVue software. Go download it. Let us know any thoughts you have in the comments section.